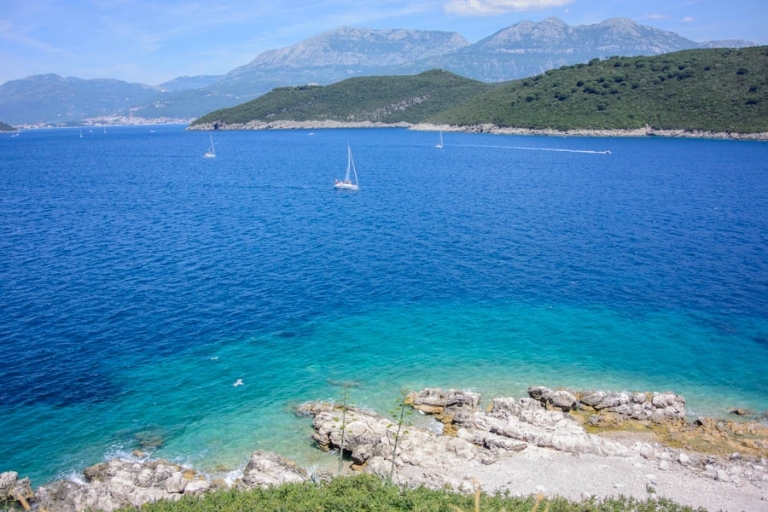 Off Montenegro’s northern coastline lie a number of islands. The most famous sits off the town of Perast (Our lady of the Rocks) but the second famous is Mamula, a fortified island which sits between the waters of Croatia and Montenegro. Here’s how you can visit the infamous Blue Cave Montenegro, the ex-naval submarine pens and the quaint little sea-side village of Rose too. 6 What’s the Blue Cave Montenegro like? 7 What about the water temperature? 23 What else could you do in Montenegro? I deliberated for a LONG time about what camera to take. I love my Nikon D800 but it’s big, heavy, expensive and definitely not waterproof. The insurance is going to be unlikely to cover it if I say I took it out on a boat and it got water damaged lol. So I opted for our under-water camera, a Nikon AW1. I am still learning how to use it and this trip gave me the perfect opportunity to play around and become more comfortable with the settings. If you haven’t considered purchasing an underwater camera I do recommend them, they can be a lot of fun. 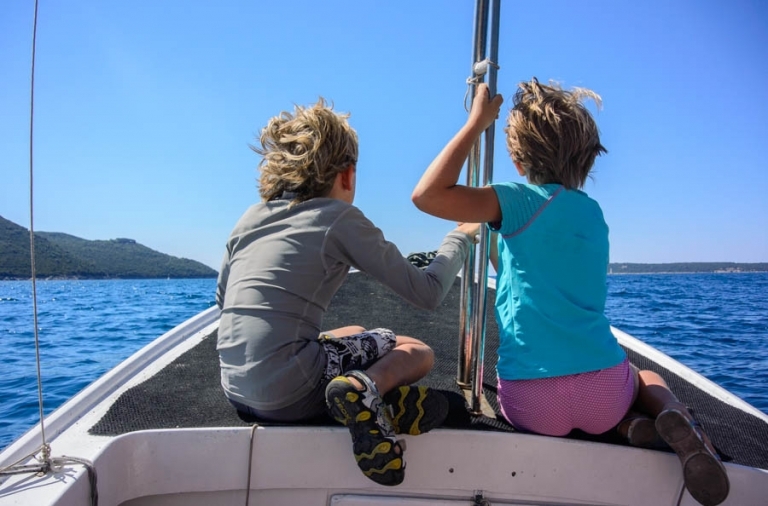 We took a five hour trip to explore the island of Mamula, have a swim in the infamous Blue Cave Montenegro, ride into the submarine tunnels and stop off for lunch at Rose. What a steal at €100! See below for who we booked with and how you can book. 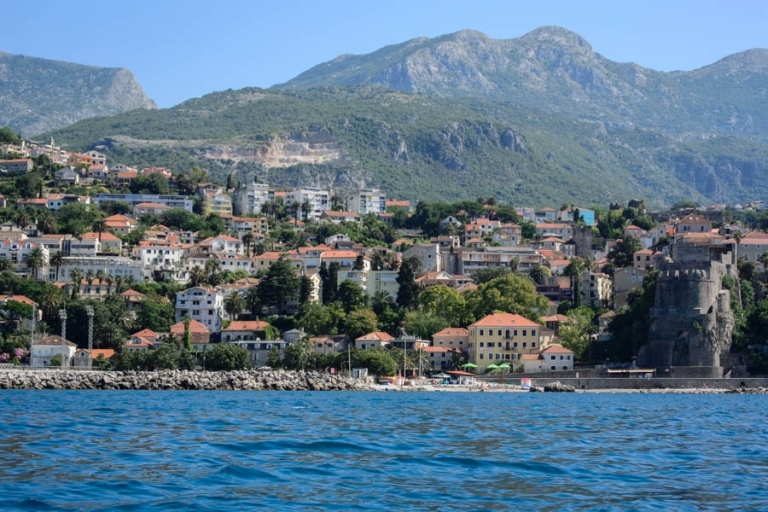 In Montenegrin waters the skipper MUST have a boat licence and for this reason boats are not available to rent personally. Good job really because I don’t fancy my chances of navigating into the blue cave. Choosing to book with Montenegro Travel Service was really easy, three emails and we’d booked and arranged where to meet our skipper, Ilija. Booking was a doddle and Ilija was very friendly and helpful. It was a great start to our trip which lasted about four-five hours. Since arriving in Montenegro nearly five weeks ago we’ve been so fortunate to have only two days of rain. The weather is also really hotting up and most days the temperature is above 30*c. This day was no different. The seas glistened that fabulous shade of turquoise, there was virtually no breeze, no waves (on the way out to the cave) and the sun’s rays pounded down on us. Heading towards the blue cave we first past Mamula and continued for about 10 minutes. Really not far. The cave has two entrances and I recommend heading for the further one first. This was you can see the turquoise waters first and the dark of the cave doesn’t spook any kids. Because when you first enter the cave it can be a little overwhelming. You know you’re close when you see the castle art. What’s the Blue Cave Montenegro like? The cave is COLD. The temperature plummets immediately and we could really feel it. The cave is dark and I don’t think we were quite prepared for just how cold and dark it was going to be. I wish we’d done some more research to prepare ourselves! In the beginning we could see creatures flying around. I presumed they were bats however they transpired to be little swallows dipping and diving for bugs. The water in the cave is COLD. There is no way to get over or away from that. Rich and two of our kids just jumped in but I gradually lowered myself in over the side of the boat. In total we maybe spent five minutes in the water before we became too cold – but we did visit in March. In hindsight we should have swum frantically to keep the blood flowing! The cave was also busy – three boats in total inside, one attempting to come in and one outside (too tall to come in). At the bottom of the page is a video of our trip showing us jumping in, what it doesn’t show is the waves which were quite big. This surprised me because outside the water was calm. If you plan on taking kids (ours were the only ones there), I would definitely recommend preparing them for the cold, the dank smell and the waves. Speeding off to the warmth of Mamula was desperately needed and we disembarked and climbed up to the fortress – which was also used as a jail. The fort was built in 1853 by Austro-Hungarian general Lazar Mamula. During World War II, from 30 May 1942 onwards, Mussolini’s Kingdom of Italy converted the Mamula fort into a concentration camp, torturing prisoners from the neighbouring area. 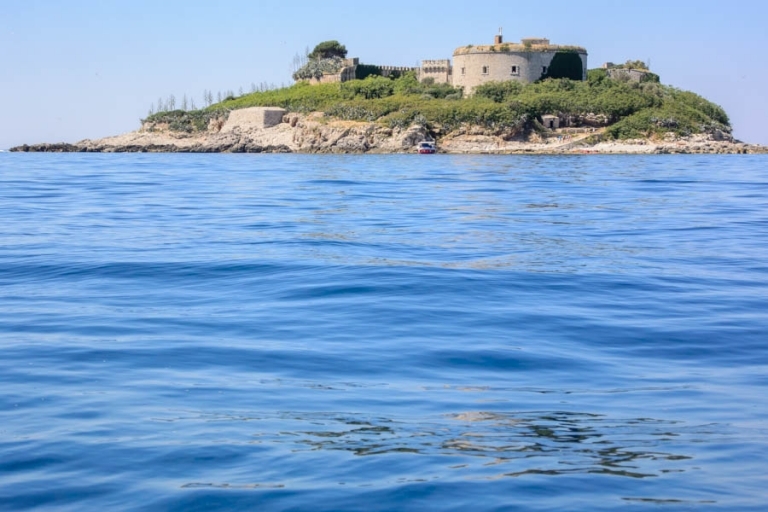 There seem to be some plans to turn the fort into an expensive, luxury spa resort (similar to Sveti Stefan no doubt) and the UN has waded in to prevent a foreign elitist financial institute from developing it. It seems to be an ongoing problem in Montenegro that foreign investment firms seize a bargain and exploit it. The island is relatively wild and the bamboo that covers it has been hacked away in places (leaving stumps) to make a path. Stumbling about we eventually made it up to the fort. Decent footwear is beneficial although we didn’t have any. There appears to be no where that is off limits on the fort. The only instruction is not to touch the birds, nests or eggs. Everywhere else is free to explore and we were given about 30 minutes on here although we could have spent a lot longer. I was surprised by how intricate the layout was. It doesn’t look complicated but there’s lots of passageways, doorways and rooms to explore. It was chilly on the inside of the rooms and there’s still some paraphernalia to see. As no where is off limits we climbed the walls with the seagulls and looked out to sea. The island ruins are actually in quite a good condition given they’re now over-run with seagulls and wild life. The view from the top of the walls is spectacular and you can see the mountains and sprawling city in the backdrop not to mention the clarity of the water! The water is a brilliant turquoise and so warm if you fancy a dip. We did! Our boat coming back to collect us. The spiral staircase inside the tower has no railings so don’t lean over too far. We left the island of Mamula and headed off to our next stop at the submarine tunnels. First we headed back along the coast towards Herceg Novi where the coast line is nothing short of amazing. The ocean is so turquoise. We’d love to go back to thise area and jump in off the shallow rocks. The water is very inviting. In total contrast the submarine channels are dark and cold! Please excuse the terrible quality of this photo. The tunnels are extremely cold, dark and deep. Our driver informed us that up until recently the tunnels held music concerts in the summer that were really cool but due their popularity are now help on land. We stopped for lunch at Rose but I think it would be nicer to stop at one of the beaches only accessible by boat. Rose is quaint with its stone clad buildings but it’s full of tourists and is accessible in a car should you want to visit another time. In fact driving to Rose you pass through the villages of Krasici and Zabrdje where you have the best view of the Kumbor straits and the Bays of Tivat and Herceg Novi. It’s definitely worth a trip. As we were leaving the dock of Rose the waters started to change and the even though they were only small, the waves started to roll in. You can see on the video how much they changed. Take a warm jumper to wear after the cave, It’s cold in there. Don’t take any cameras that aren’t waterproof. Put phones in a splash proof bag. Take sensible shoes so you can explore Mamula. Ask for more time at Mamula to swim. Negotiate lunch somewhere different than Rose. It’s quaint but full of tourists. Consider booking an entire day on the boat so you’re not rushed. What else could you do in Montenegro?